Pseudoscience Redux: Greenwashing - Is there really a sustainable Orange Roughy fishery? One of our grocery stores sells a brand of frozen fish, and the packaging says “our company supports sustainable seafood practices”. Note that it does not say “this product is sustainable”. It drives me nuts. There are a number of organizations (such as Seafood Watch from Monterey Bay Aquarium, or the Blue Ocean Institute’s Guide to Ocean Friendly Seafood. The Blue Ocean Institute is based at the School of Marine and Atmospheric Sciences, Stony Brook University (my home institution) so I know more about their process. They often hire students in marine sciences to do extensive literature searches to score certain seafoods as safe and sustainable vs those whose consumption is bad for the environment. With the increasing use of technology, they developed an iPhone app called FishPhone, which you can download and use while you are seafood shopping. Just wanted to put that out there so maybe your concerned readers with advanced technology (I am still using a flip-phone!) could use it. 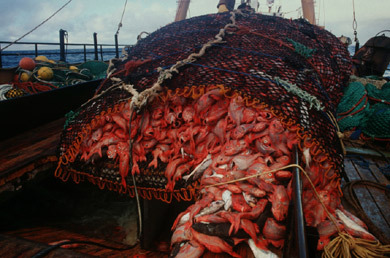 What I really want to see is evidence that bottom trawling fishing methods like those used to harvest orange roughy, are sustainable. I suspect it’s about as sustainable as mountaintop removal mining. See here for a discussion on the effects of bottom trawling. I can’t believe anyone would even try and claim “sustainability” for orange roughy… the situation of the stocks in New Zealand, and the increasing rejection of the species by retailers, is summarised in a briefing here: http://www.greenpeace.org/raw/content/new-zealand/press/reports/orange-roughy-rejection.pdf – as for Australia it’s listed as a threatened species there. Get a life. I’m gonna eat all the roughy I want I don’t care how few there are left.